Restore Rust Remover is a water-based, non-acidic, non-toxic, biodegradable derusting concentrate. The contents of a 500ml bottle, when mixed with plain tap water makes 10 litres of fluid (approx 2 gallons). Because it does not contain any acids, only the rust is removed, leaving good metal undamaged. Once the rust has been removed the chemical reaction stops. (Products containing phosphoric acid will remove both the rust and a certain amount of good metal which may not be desirable). Because of the absence of acids, there is no danger of flash rusting occurring when parts are removed from the bath. In fact, parts will remain rust free without further protection for a considerable period, allowing plenty of time for painting, chemically blackening, or plating parts or tools. Alternatively, to give longer protection in the ‘bare’, cleaned state, they may be protected with MetalGuard Ultra or ToolGuard VCI. The derusting solution may be used over and over again until the solution becomes blackened and the reaction time becomes excessively slow. Because the residue is completely biodegradable the spent solution may be flushed down the drain without harm to the environment. Litre for litre, Restore Rust Remover is the most economical product of its kind currently available. 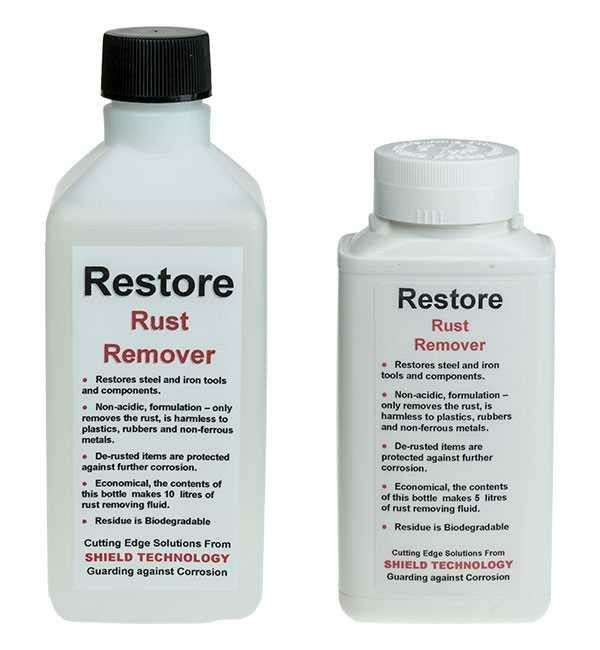 Restore Rust Remover is supplied in 250ml and 500ml plastic bottles.